I got my homey today and hoped to be happiest guy in the world, but it seems I was over exited. I tried Homey out in my office, got it connected to wifi and then it looses connection. Yellow ring is glowing and no communication. Made some restarts, tried another power source and cable and got it back working few times. But made some flows and same thing happened again - yellow circle out of nowhere. Now Im at my home and hoped to start over again and put some time and effort into it. Strange is that i cant get it working at all. I have read from this forum different things and nothing seems to have effect. If i let it be then it glows orange few minutes and then red. I tried holding upside down, sometimes it starts glowing yellow but still nothing. I even changed my wifi to be same SSID and password that I use in office - maybe homey is lost. But no. this doesnt help also. Any tricks I should try before sending unit back to Athom? Look if the volume is ok, orange ring is homey listening or speaking most of the time. tried entering recovery mode and doesnt work. Actually I can see one Hidden wifi network that belongs to Homey but nothing else. One time I managed to start it. Then I turned it upside down to enter recovery mode - nothing. After some time again red circle. Are you using the original Power supply? please do, but if you already did try an other 5 Volt 2 A USB adapter just for sure. If you cant enter Recovery contact Athom Support directly by email. I managed to make full recovery for Homey and now it glows green. What does this mean? 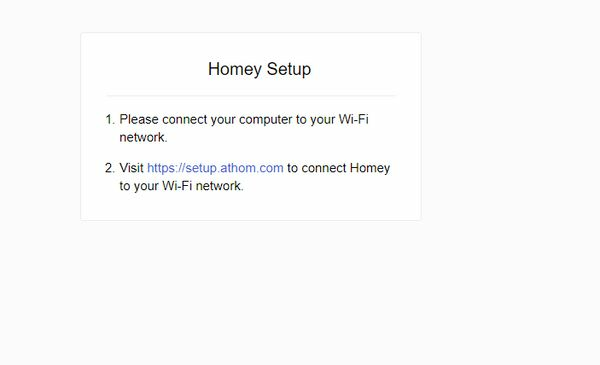 Also I found Homey is in my wifi network but I cannot connect via desktop app or mobile. Setup is done thru connecting your laptop/desktop to the Homey network for a short while, when asked on the setup.athom.com page. Ending the setup, you have to switch back to your regular WiFi network at home. Did you follow the instructions like in this Homey setup video? Hi, yes did everything many times. Turned out I recieved faulty unit. Shipped it back to RMA today. Hope to get replacement soon. Once it's working, you gonna enjoy your Homey for sure.